I was walking by a store yesterday and my eye was caught by a brown, leather bag. I pressed my head against the window to see if I could see a price tag. It was a good price, in my opinion, and I thought I should get it in case of an emergency. I kind of looked inside, but not really. It’s a big bag I’ll be throwing things in so the inside pockets really don’t matter to me. I knew there was something inside of it, but I figured it was just another bag to keep this one in with an extra strap. But when I went to use it this morning, there was a whole other purse inside. The more I look at it, the more I think all of this goes together. I just can’t believe the price. If I’d paid $75 or over, I’d be fine, but I didn’t pay close to that. I don’t see that as being an accessory. If it is, these purses were an INCREDIBLY good price. 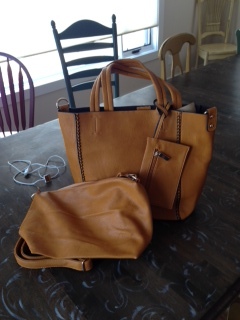 And the second one doesn’t have a price tag and matches completely so I may not have stolen a second purse. I may not have a life of crime. I may not need to flee to Canada later today. But I feel guilty. OK, the title to this piece is misleading. I do feel guilty. I don’t feel guilty about stealing, though. (Because I didn’t actually steal anything. I just may have walked off with merchandise I didn’t pay for.) I feel guilty that the boss came in and screamed at the employee for not taking the second purse out of the first one because the one I bought was a display and the 2nd one could’ve been used to puff out the first one to make it look bigger. And I would question none of this except I saw almost the exact purse without a second one inside. Maybe someone stole THAT purse. So I’m going to call this morning, and make sure everything is fine. Because I’m a nice person. And I’m kind of hoping that I’m completely wrong about this and I get two purses for the price of one. Or if I’m right, maybe a free cookie. No store would use a purse to puff out another purse. That’s what tissue paper is for! I wonder if someone set that up, planning to come and buy it later, but you got there before they did. Though, the lack of a tag on the second purse makes me think maybe not. Or that someone else set it up in order to get a free purse, and then changed their mind or chickened out. It’s been a while since I’ve bought a purse. I’d forgotten about tissue paper.